A full frontal view of Gallia Academy High School, which opened in 2009 in Centenary, Ohio. Much like the academic building itself, a majority of the Blue Devils’ and Blue Angels’ sporting events are held at this facility – both now and in the years to come. Gallia Academy junior Wes Jarrell (2) splits a trio of Jackson defenders for a shot attempt during the first half of a Division II sectional tournament contest at Southeastern High School in Londonderry, Ohio. In the end, it was a decision based on a numbers’ game. After nine decades of athletic competition as a founding member of the Southeastern Ohio Athletic League, Gallia Academy High School decided to go down a new road after unanimously approving an invitation to the Ohio Valley Conference at a regularly-scheduled Board of Education meeting held Wednesday, Nov. 19, 2014, at the GAMS library in the Old French City. The SEOAL – the oldest non-city athletic conference in the state – has served as a standard bearer for southeastern Ohio prep sports since its inception back in 1925, with 20 different schools competing under the league’s banner during that span. 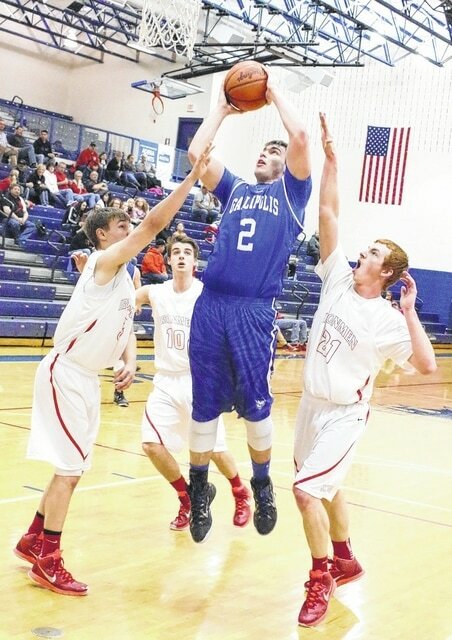 The height of the SEOAL came during the 2006-07 school year, when a then-record 10 programs from Zanesville to Portsmouth battled one another in a variety of athletic endeavors. But later that same year, Athens High School – another original member of the SEOAL – announced that it was leaving for the more-locally based Tri-Valley Conference, which officially happened in the fall of 2008. That initial tumbling domino started a chain reaction that has led to the additional losses of Zanesville (2008-09), Ironton (2009-10), Marietta (2010-11), Chillicothe (2012-13) and Portsmouth (2014-15) for a variety of reasons, leaving only four programs – GAHS, Jackson, Logan and Warren – to continue carrying the SEOAL flag. Despite numerous efforts to keep the 90-year old league alive in the past few years, no other community has stepped in to fill the void. With only four schools working together, the biggest problem facing each of these programs no longer came down to money in tough financial times – it simply became a matter of scheduling. And with a steady decline in population over the last two decades while areas like Logan, Warren and Jackson are seeing growth, Gallia Academy – the smallest of the remaining four SEOAL schools – was left looking at another problem that no other SEOAL member had to face. Enter the Ohio Valley Conference, which currently consists of more equally-sized schools to GAHS in the likes of Portsmouth, Ironton, Chesapeake, Fairland, Coal Grove, South Point and Rock Hill. After several failed attempts to sway Gallia Academy to the OVC following River Valley’s departure announcement, the current league members ‘put their money where their mouths were’ on Wednesday, Nov. 6, when they voted 7-0 in favor of adding the Blue Devils and Blue Angels to the league during a meeting that GAHS attended simply to see what the OVC had to offer. The representatives from Gallia Academy approved the decision during that meeting, with the stipulation that the Gallipolis City School BOE could only make it official by ratifying the move by vote at the November 19 meeting. Board members Lynn Angell, Robert Cornwell, Dr. Tim Kyger, John O’Brien and Amee Rees approved the move to the OVC by a 5-0 count during that historic – but sparsely attended – meeting, allowing Gallia Academy to secure a more stable future for itself in the upcoming decades. Gallia Academy currently has enrollment numbers of 253 boys and 224 girls in its top four grades. Those 477 kids would currently make GAHS the largest school in the Ohio Valley Conference. The current OHSAA enrollment figures at the other OVC programs are comparable. South Point is the second-largest school with 405 students, followed by Fairland (390), Rock Hill (355), Portsmouth (362), Chesapeake (335), Ironton (315) and Coal Grove (275). Conversely, Logan is the largest SEOAL program with 939 students, followed by Jackson with 603 and Warren with 542. Those numbers were also collected and approved by the OHSAA in the summer of 2012, and the next batch is set to roll out in the spring or summer of 2015. Brent Simms was the acting athletic director at Gallia Academy during the change, and his words may have best summed up the reason for the move — rather popular or not. Though the impact of Gallia Academy’s move to the OVC was felt throughout southeastern Ohio, is still only came in at No. 2 on the OVP Top 5 Stories of 2014-15. The top story from the tri-county area will appear in the weekend sports editions of the Point Pleasant Register and The Sunday Times-Sentinel.